was neither an easy person to like nor an easy writer to read. Thoreau described himself as a mystic, a Transcendentalist, and a natural philosopher. He is a writer of essays about nature---not of facts about it but of his ideals and emotions in its presence. His wish to understand nature led him to Walden Pond, where he lived from 1845 to 1847 in a cabin that he built. Though he was an educated man with a Harvard degree, fluent in ancient and modern German, he preferred to study nature by living "a life of simplicity, independence, magnanimity, and trust." Knowing this, we should beware of misreading the book that best reflected this great experience in Thoreau's life: Walden; or, Life in the Woods (1854). It is not a handbook of the simple life. Though there are elements in the book of a "whole-earth catalogue" mentality, to focus on the radical "economic" aspects of Thoreau's work is to miss much in the book. Nor is it an autobiography. 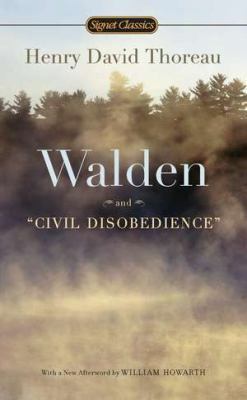 The right way to read Walden is as a "transcendental" narrative prose poem, whose hero is a man named Henry, a modern Odysseus in search of a "true America." Thoreau left Walden Pond on September 6, 1846, exactly two years, two months, and two days after he had settled there. As he explained in the pages of Walden: "I left the woods for as good a reason as I went to live there. Perhaps it seemed to me that I had several more lives to live, and could not spare any more time for that one." Growth, change, and development were essential to his character. One should not overlook the significance of his selecting July 4 as the day for taking possession of his residence at Walden Pond, a day that celebrates the establishment of a new government whose highest ideal is individual freedom. In terms of Thoreau's redefinition of the nation-idea, "the only true America" is that place where one may grow wild according to one's nature, where one may "enjoy the land, but own it not." Thoreau believed that each person should live according to individual conscience, willing to oppose the majority if necessary. An early proponent of nonviolent resistance, he was jailed briefly for refusing to pay his poll tax to support the Mexican War and the slave system that had promoted that war. His essay "On Civil Disobedience" (1849), which came from this period of passive resistance, was acknowledged by Mahatma Gandhi (who read it in a South African jail) as the basis for his campaign to free India. Martin Luther King, Jr. later attributed to Thoreau and Gandhi the inspiration for his leadership in the civil rights movement in the United States. Thoreau contracted tuberculosis in 1835 and suffered from it sporadically afterwards. His health declined over three years with brief periods of remission, until he eventually became bedridden. Recognizing the terminal nature of his disease, Thoreau spent his last years revising and editing his unpublished works, particularly The Maine Woods and Excursions, and petitioning publishers to print revised editions of A Week and Walden. He died on May 6, 1862 at age 44. Purgatorio, numerous plays and books of prose. Some of Merwin's honors include the Aiken Taylor Award for Modern American Poetry, the Bollingen Prize, the Governor's Award for Literature of the State of Hawaii, the Ruth Lilly Poetry Prize, the PEN Translation Prize, the Shelley Memorial Award, the first Tanning Prize and a Lila Wallace-Reader's Digest Writers' Award. He also received fellowships from the Academy of American Poets, the Guggenheim Foundation, the National Endowment for the Arts, the Rockefeller Foundation and a Ford Foundation Grant. He is a Chancellor of The Academy of American Poets and received a five-year term as judge of the Yale Series of Younger Poets.